It's the time of year for lots of hosting & entertaining, so naturally you want your place to look the best it possibly could. I know lots of people who take this opportunity to finally work oh home upgrades, not only for guests, but also to start the year off with a fresh look! But what do you do if you don't have the budget (or desire) for a complete design overhaul because you're buying gifts & things for the holiday season? I know as a kid I used to wonder why every single holiday had a corresponding furniture, wondering who could possibly be changing out their furniture that often. No one. That's who! So now here you are with a house full of furniture -- some that can go, but others that are perfectly fine. How do you achieve that new picture perfect holiday look without breaking the bank and using what you've got? This project wasn't like my usual projects. Since he had majority of the furniture already, we weren't working on a new design... this was what I like to call a re-design! 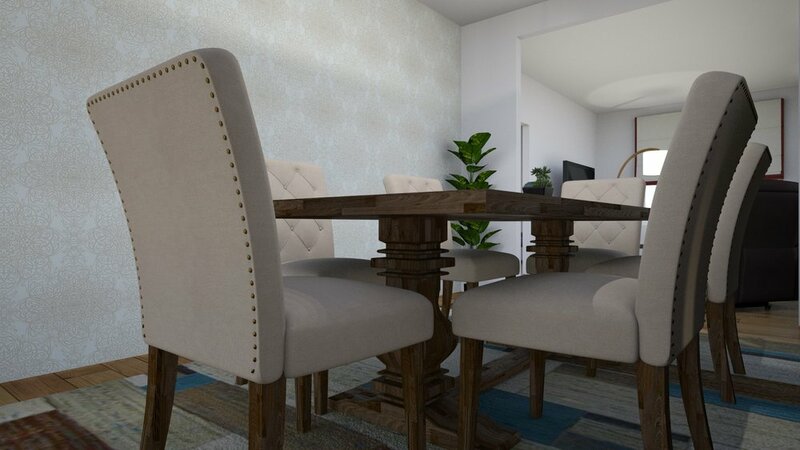 The catalyst for this redesign was to finally give the dining room a MUCH needed update, right in time to be hosting Thanksgiving dinner! We were using a lot of existing furniture -- mostly in the living room -- so that we could keep the spending low & the focus on the dining room. For many, they think having a ton of pieces from here & there puts them at a disadvantage, and although it may not always be the easiest design to put together it certainly isn't impossible. Working with existing furniture just takes a bit of creativity & willingness to look at the space holistically, visualizing the existing pieces as new. I took an inventory of all the existing pieces and found one aesthetic commonality -- a sort of rustic charm -- and this became my aesthetic launchpad & overarching theme for the project. Being that this design was for a single man, we wanted to keep it masculine but still warm & inviting, so "rustic charm" defined it perfectly. Believe it or not, the "big chair" inspired A LOT of the design. Its soft masculine qualities would act as the barometer used to measure the pieces pulled into the design -- from the industrial style bar cabinet & chandelier to the contrasting neutral & cool tones of the rug. The wood tones from the tv stand became the thread throughout the design that could be found in many of the marquee pieces such as the cocktail table and dining table. Don't think your home is "holiday ready"? I challenge you to look at it with fresh eyes & a fresh perspective. What can you move to another room? What can you upcycle, refinish, and/or reupholster? What do you genuinely need to replace? Take time to really assess & edit your space, and don't forget to have fun.